This is the place where King Felipe II was born, the Catholic Monarchs Ferdinand and Isabel was married, and Christopher Columbus died. Opening hours: Shops are generally open from 09.00/10.00 to 14.00 and from 17.00/17.30 to 20.00/20.30. Most shops are not open on Saturday afternoons (except for large department stores) or on Sundays. Banks are generally open from 08.30 to 14.30 from Monday to Friday. 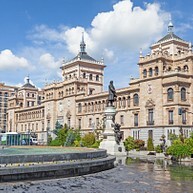 Valladolid offers a wide range of activities like theatres, historical sites, and many top museums. 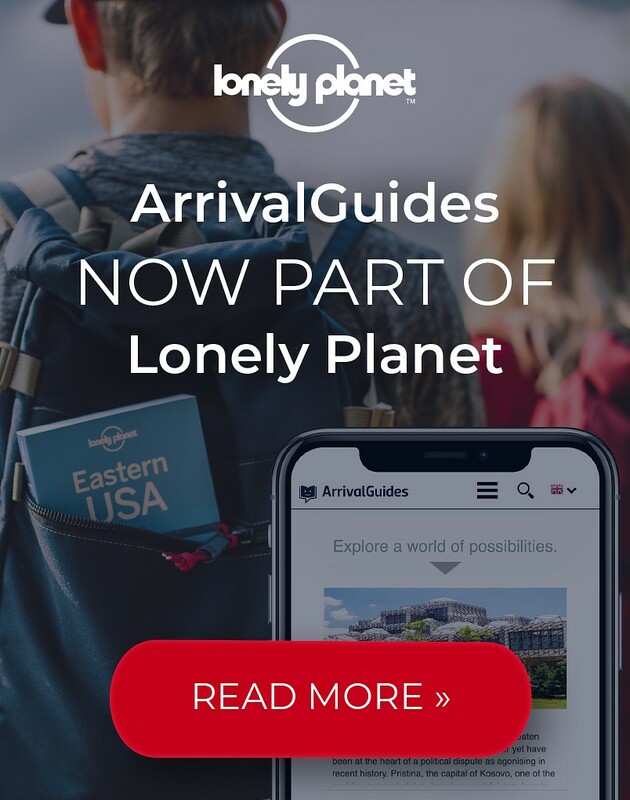 You may go look for beautiful and popular sites such as Plaza Mayor and Plaza de San Pablo, the Museo Nacional de Escultura, and the Museo del Arte Contemporaneo Español. There is so much to see and learn in this city, which has had such a huge impact on the history of Spain and the American continent! One more tip, if you have not yet learned about the decisive Valladolid Controversy, this is a good thing to read about before or during your stay. 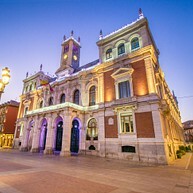 Plaza Mayor is the main square of Valladolid and an unmissable sight. Flanked by vibrant red buildings, this glorious old square is located in the very heart of the city. In the summer, many outdoor activities take place making it the perfect spot for a coffee break with a nice view, notably on the Town Hall. 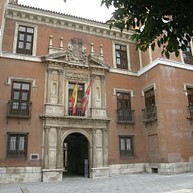 The Academy Of Cavalry is a beautiful building in the heart of Valladolid. This museum which was created on March 1st 1899 is located in the splendid building of the Academia del Arma. You can rarely visit the inside, but the outside is worth having a look with its impressive facade and fountains. The National Museum - Museo Nacional de Escultura - is located right in the middle of Valladolid and it boasts a brilliant display of poly-chrome wood with the sculpture of the Spanish Renaissance. 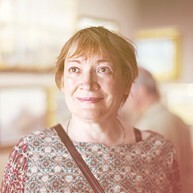 The museum is widely renowned for its high quality sculptures and historical exhibitions. 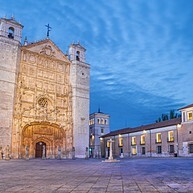 The Plaza de San Pablo is among the most historical sights of Valladolid. Felipe II was born in the Palacio de Pimentel on the Plaza de San Pablo in 1527, and as testimony, a fabulous tiled mural relates the life of the king and the history of sixteenth-century Valladolid. 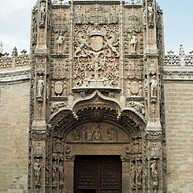 In the square is also the magnificent Iglesia de San Pablo located. The Museo Oriental offers a collection of exquisite examples of Chinese, Japanese and Filipino art, gathered during four centuries of Spanish missionary exploration. This museum is located in the Royal College of Augustinian Fathershe, built in 1759. The Casa-Museo de Cervantes is where Cervantes lived from 1603 to 1606, in what was then an unfashionable and malodorous district of Valladolid. It was then redecorated with more modern tastes and now hosts regular exhibitions related to the famous author of Don Quichote. Santa Maria la Antigua - in English Church of Saint Mary the Ancient - was founded in 1095 but there are no remains of the original structure and its remaining oldest part is from the 12th-century. 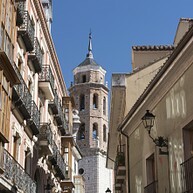 This symbolic church has four floors and is located in the heart of Valladolid. This museum exhibits pieces of contemporary art from 1918 to present days and it is located in the cloisters of the Monasterio de San Benito. El Museo Patio Herreriano has an impressive collection, and when here stop by the book and souvenir shop. 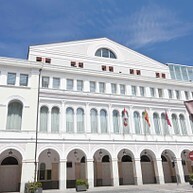 The Teatro Calderón, named after the playwright Pedro Calderón de la Barca, is Valladolid’s main theatre and concert hall. It has a lively programmer of plays, jazz, opera and flamenco. It also hosts Seminci, the Semana Internacional de Cine de Valladolid (the International Film Festival of Valladolid). Just a few steps away from the river Rio Pisuerga you can stop by Museo de Valladolid, one of the historic sites of the city. Divided into two sections, this museum features archaeological pieces of Valladolid as well as fine arts, including painting, sculpture, furniture and tapestries. This is the place in Valladolid to sit down and relax at any time of the day. This large and green park located in the city centre is a delightful place to stroll among the peacocks and red squirrels, or kick back with an ice cream and watch the locals at leisure. This beautifully designed concert hall opened its doors in 2007 and can take up to 2,000 people. Here you can enjoy an evening of top-notch musicals, plays, shows and concerts (check their website for programs). It also boasts one of the best and most modern restaurants in town. 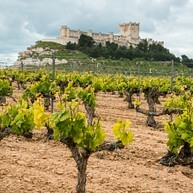 The area surrounding Valladolid is one of Spain’s major wine producing regions. Most of the actual bodegas don’t admit visitors, so this museum, which offers wine-tasting, guided tours, winery visits, is a good alternative. It is located in Peñafiel´s wonderful old castle. Borrow a bike and explore Valladolid like you have never dreamt of. The tour is led by a professional guide who shares his knowledge about the city in an entertaining, dynamic and funny way. The tour last for three hours and take place during the daytime or why not choose "Valladolid by Night" tour and explore the city under the moonlight? You will find the Columbus Monument just outside the train station on the corner of Paseo de Filipinos, where it was inaugurated in 1905. 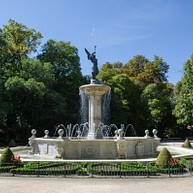 The sculptor of this beautiful monument was made by Antonio Susillo, of Seville. The statue commemorates the death of Columbus, which took place in Valladolid. 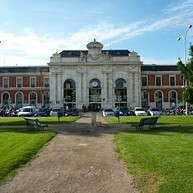 Valladolid's U shaped train station is an interesting piece of architecture, designed by French architect Enrique Grasset in the style of French eclecticism. The main facade, which is configured as a triumphal arch, is made of stone and its three large openings that serve as entrance doors are separated by pilasters.